Law Enforcement uses aircraft…so can you! This unique asset is available to you as we manage your case and is just another reason Gumshoe Detective Agency is the right choice for your needs. Search for stolen vehicles, boats, etc. While weather or airspace restrictions may prohibit use of aircraft at times, the benefit of Aerial Surveillance is less personnel on the ground, ability to view otherwise concealed areas and a greater opportunity for success while maintaining concealment. We don’t use drones. Drones must fly below 400′ and are so noisy the first thing someone on the ground does when they hear a drone is look up! We fly at a high enough altitude to be both quiet and covert. And we can follow our target safely for hours with the aircraft. The aircraft is equipped with HiDef cameras controlled from the cockpit by the Aerial Investigator who can record each camera’s view, pan and zoom in or out as needed. An additional camera records crew activity as well as speed, altitude and GPS location tracking for use in court if needed. The aircraft is equipped with a customized UHF radio system that enables the Aerial Investigator to communicate diretly with our ground units over three repeater channels and six tactical channels. Aerial Investigators undergo Air Crew training to include pre-flight, post-flight, flight safety, human factors, Crew Resource Management (CRM), aerial surveillance and photography, radio communications and use of specialized equipment such as gyro stablized optics and our unique surveillance camera system. Some have primary flight training and are licensed pilots themselves. Precise logs are maintained of their flight hours and crew training for testifying in court if needed. The target keeps his new residence location a secret from the courts and his spouse and uses complicated evasive maneuvers to see if he’s being tailed. But the airplane tails him to his new residence and then documents his relationship with a female. The target enters a self-storage lot not visible from our investigators on the ground and the airplane documents the target’s activities. The target lives in a remote location where ground surveillance is not possible without being seen and the airplane surveils from the air and notifies the ground unit when the target is departing. The target is tailed from the air over several counties and the ground unit is able to remain back and covert unless needed to make ground observations such as obtaining addresses, license plates, etc. 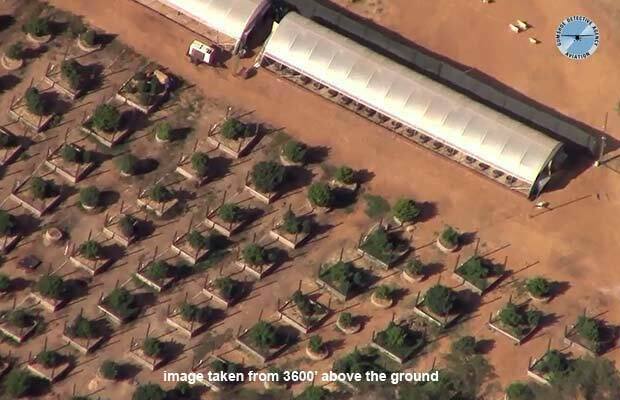 The airplane documents a large marijuana grow otherwise hidden from the road. 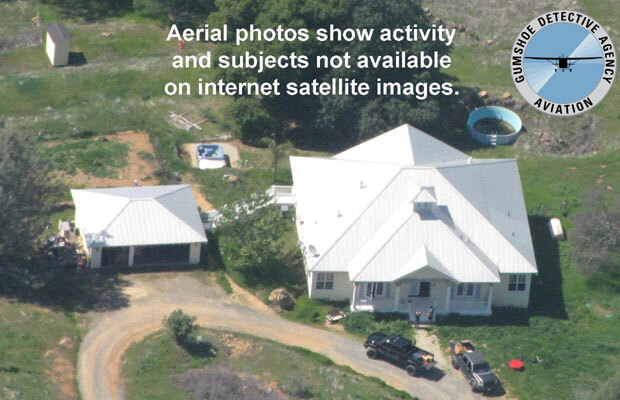 Fresh Aerial Photos for the Attorney Client are obtained for court revealing activity, persons and vehicles not visible on internet satellite images. We can be a speck in the sky and still watch our target. We’re able to monitor, photograph and video our target while remaining in constant communication with our investigators on the ground. 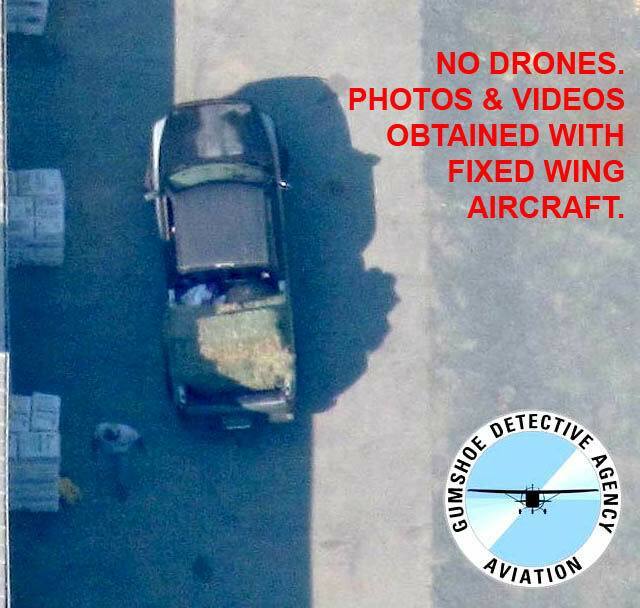 Gumshoe’s Air-Ops insures you of the most accurate and current visual available. No more out of date satellite pics. Image taken through thick smoke layer of target at work. Gumshoe’s Air-Ops obtain all air surveillance using fixed wing aircraft. Gumshoe Air-Ops is able to obtain air surveillance images through thick smoke and other adversities.